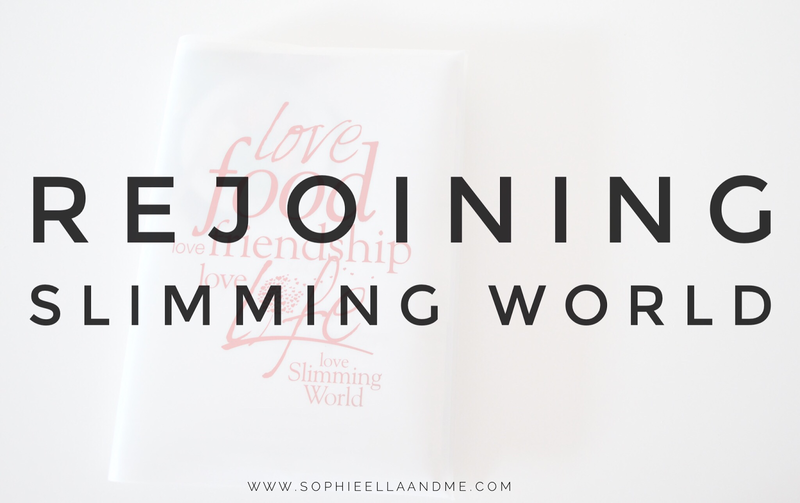 If you've been following this blog for a while, you may know I have previously been a member of Slimming World. In fact, I've been going on and off for the past three years. However, after gaining all of the weight I had previously lost (and a lot more), I decided to rejoin last week. I am so determined - more than ever before to lose weight and to be healthy again. I joined Slimming World for the first time in 2013, just three months after having Sophie and lost two stone in about six months. I felt amazing and confident. However those two words are sadly the complete opposite of how I've been feeling for a very long time now. I lost all motivation and stopped going to group altogether, which meant my old eating habits soon reappeared and the weight I lost gradually creeped back on. It just spiralled out of control and I'm now the heaviest I have ever been, which makes me feel so ashamed of my myself. How did I let myself get to this point? In all honestly, it makes me miserable. I have zero confidence and I avoid looking in the mirror because I hate the person looking back at me, I am constantly paranoid that people are looking at me and judging me because of my weight and I hate the fact that I'm not living my life properly and enjoying it as I should. I feel like my weight is holding me back from so many things. I know it's no one else's fault but mine, that I am like this. Something needed to change. And I'm finally gaining control and doing something for myself for a change. I want to be a healthy weight and to look & feel good about myself, to have more confidence, to have more energy and not get out of breath so easily and not be embarrassed about seeing photos of myself. I have set up a separate Instagram account, where I post all of my Slimming World meals - you can find me at @emmalambertsw. I relate with this post so much... I also lost a lot of weight but then I got a depression and from 55Kg I went to 80Kg in just a matter of months! I know the struggle and the lack of motivation BUT I can give you a great advice that I've been taking it myself: accept your body, accept it the way it is right now. Once you do it you can say out loud to the mirror "I'm like this now but I don't have to look like this forever!" I hope this helps you! I have to check Slimming World, I never heard about it before! Good luck. Writing it down and committing to it is the best way to make it a reality. We all have setbacks but you can do it. I love following your new Instagram! Well done for re joining. I think that's harder than actually joining fresh. I'm a SW member too :) All the best lovely.